The new city also brought a new country into focus with a number of Scottish fighters on the card hoping to put on a great show in front of their home crowd. One man was also looking to put on a show in front of the Scots in the crowd even though he is from the rivals to the south. First the Scottish MMA fans had were treated to their future of fighting in three Scottish competitors all trying to show that Scotland has its own fighting tradition. All three could be considered veterans in MMA but none have had much time in the UFC. They are the first wave of what many in the crowd hope to be a great influx of Scottish fighters. Rob Whiteford, Stevie Ray, and Joanne Calderwood all have done things the tough way as they headed into the card. They had toiled away in smaller promotions before finally being recognized by the king of promotions in the UFC. They have all fought in the local Scottish circuit and made their way to the top and although some may be more well-known than others they all entered the night in Glasgow with hopes of ignited a crowd. First up was Robert Whiteford who had the distinction of being the first Scottish fighter to fight in his home country for the UFC. Whiteford wasted no time in showing what the Scots had in store for the night as he went into the first round swinging against his Irish opponent. Paul Redmond did not back down though until Whiteford finally caught him with a big overhand left that sent Redmond to the ground. From there it was all Whiteford who quickly pounced and ended the fight in the first round and got the crowd into a frenzy when he jumped out of the octagon and pulled a Jose Aldo jumping into the crowd. Whiteford was just the start of the night for the Scottish fighters though as next up was Stevie Ray who had been fighting in the minor leagues for a long time. Ray got his chance last April when he filled in for an injured Jason Saggo and beat Marcin Bandel with a TKO. Now he entered Glasgow with a chance to prove that he belonged and that his first fight was not a fluke while also trying to keep the momentum going. Ray was set to take on Leonardo Mafra and tried to make it a short night for the many fans that he has in Scotland. He did just that with a straight right two minutes into the round that sent Mafra stumbling into the fence. Ray began trying to finish fight throwing wild bombs while Mafra attempted to recover and throw his own shots. Eventually a left hook landed right on the chin and Mafra’s legs were gone from under him as Ray sent the stadium into a frenzy. The man known as “Braveheart” had made it two for two in Scotland for hometown fighters and left it up to the most accomplished Scottish fighter to finish the job. Calderwood came into the UFC through The Ultimate Fighter TV show where she ranked third in the tournament to determine the first strawweight champion. Since that show though she has not impressed much but now was her time to do just that in the best possible place against a fighter making her debut in the UFC in Cortney Casey-Sanchez. Calderwood came out pressing and clearly trying to match the intensity of her countrymen to start the fight. That proved to be a bad decision at the start as Calderwood was rocked quickly by the American but survived by clinching against the fence before ending the fight in a top position. 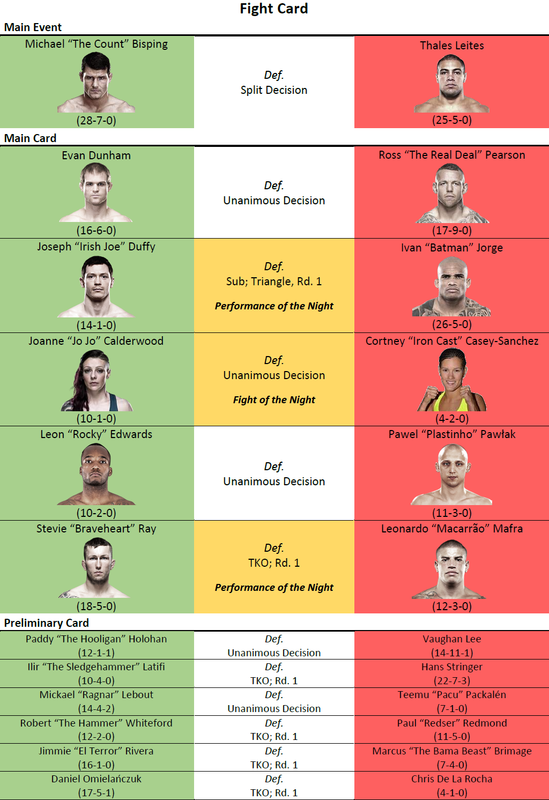 The second round was a little different as Calderwood came out more controlled and found her range while earning a dominant clinch and earning top position. The third was a completely different fight though as both women came out swinging for the fences and looked for the knockout. Eventually Calderwood landed a big spinning back kick to the stomach of Casey-Sanchez that sent the American to the mat quickly. Casey-Sanchez survived the damage but she was tired and Calderwood knew it continuing to take top position then standing the fight up in a great final round. It may not have been as thrilling as her two countrymen but Calderwood got the job done with a unanimous decision win in the place she calls home. All of the Scots did their job and then it was time for the most popular British fighter to take a turn at getting the crowd fired up, even if he was from England. Michael Bisping was looking to move back up the middleweight division against a tough fighter in Thales Leites who had been climbing fast in the division. The British Boxer was taking on the ground game of Leites in a classic matchup between two middleweights who were both trying to make their comebacks in the division. From the start this fight turned into a boxing match and that was not a good thing for the Brazilian Jiu Jitsu black belt. Bisping did take some damage but eventually his boxing prowess showed through as his stick and move ability came through. 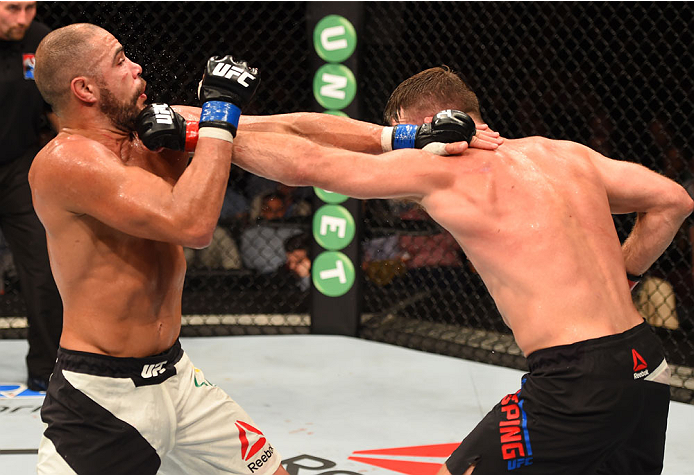 Bisping took home the split decision win and kept the fans happy as he continued on the comeback trail while Leites’ comeback attempt was stopped short. Overall the first UFC fight in Scotland was a success as three Scottish fighters took home wins and a fan favourite followed suit.